Latest collection of reception lehengas online at best prices. Choose from the huge collection of designer reception lehenga at Kalkifashion. Good quality bridal wear is big-ticket unless you find really good deals online or purchase something during the offer period. Irrespective of what you want to buy, you should have a monetary quantum pre-decided in your head, with a little buffer to spend if you really like the outfit. Like sheep in a herd, most brides simply latch on bridal wear like gowns for reception. What they fail to understand is, there is a myriad bridal dress collection in the fashion arcade for the purpose; which is to make the wearer look like the best version of themselves. Run through the internet to understand your exact body shape and then pick the pattern that will suit your body type in the most pertinent manner. 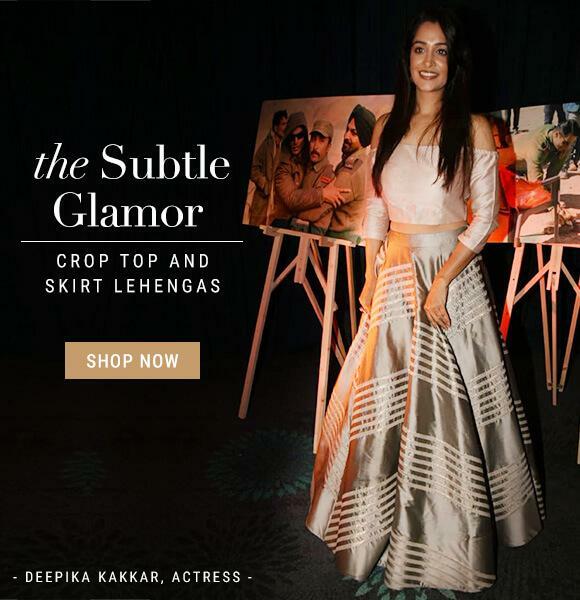 Hour glass bodies look the best in crop top and lehengas/ palazzos, and dhoti-style sarees as these outfits accentuate their curves and exhibit a flawless body shape. Pear shaped bodies need to take attention away from their lower body. So, they can choose anarkalis or reception lehengas with jackets. Similarly, for every body type, there is an ideal outfit type. Choose yours wisely before you procced to finalize the design. Once the first two requisites are fulfilled, the next step towards your dream bridal lehengas for reception is choosing the right color and ornamentation. Reception being the last of all wedding rituals will be the one that will be remembered by all your guests and you cannot afford to look dull. Choose deep colors with flamboyant embellishments like pearls, sequins, embroidery, fur and gota work. Explore the widest range of reception lehengas on Kalki where we assure you that you can literally finalize your outfit with the three steps mentioned above!